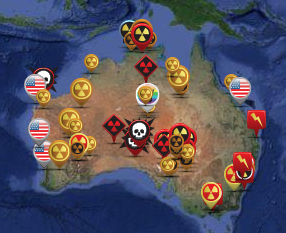 Ahead of Monday’s release of the draft report of the Nuclear Fuel Cycle Royal Commission, SA Traditional Owners are once again voicing strong opposition to proposals for expanded uranium mining and proposals for nuclear waste dumps and other nuclear projects. South Australian Traditional Owners say NO! Statement from a community meeting held in Port Augusta on Saturday 16 May, 2015 to discuss the Royal Commission into the Nuclear Fuel Cycle. We oppose plans for uranium mining, nuclear reactors and nuclear waste dumps on our land.We call on the SA Royal Commission to recommend against any uranium mining and nuclear projects on our lands. We call on the Australian population to support us in our campaign to prevent dirty and dangerous nuclear projects being imposed on our lands and our lives and future generations. Endorsed by members from the following groups, Kokatha, Kokatha-Mirning, Arabunna, Adnyamathanha, YankunytjatjaraPitjanjatjara, Antikirinya-Yunkunytjatjara, Kuyani, Aranda, Western Aranda, Dieri, Larrakia, Wiradjuri.